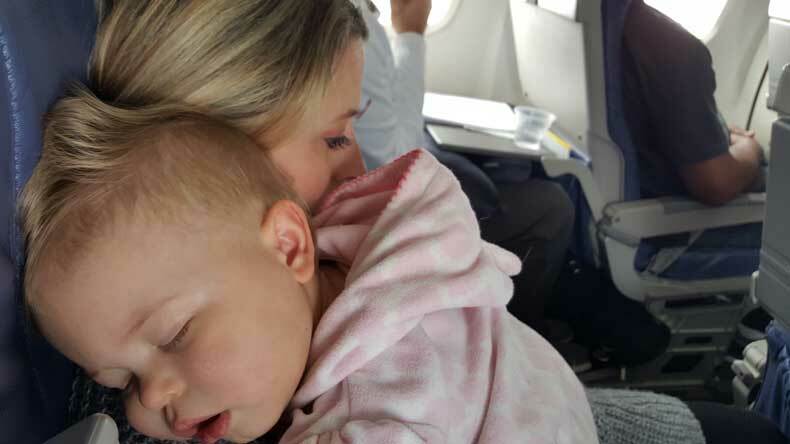 Flying with a baby can be stressful, but it doesn’t mean you shouldn’t do it. 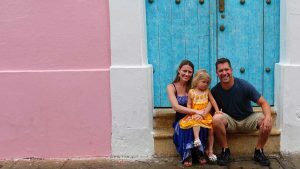 I am not a proponent of sacrificing travel for the first few years after having a child. In fact, I say fly as much as possible, while your baby still flies free! 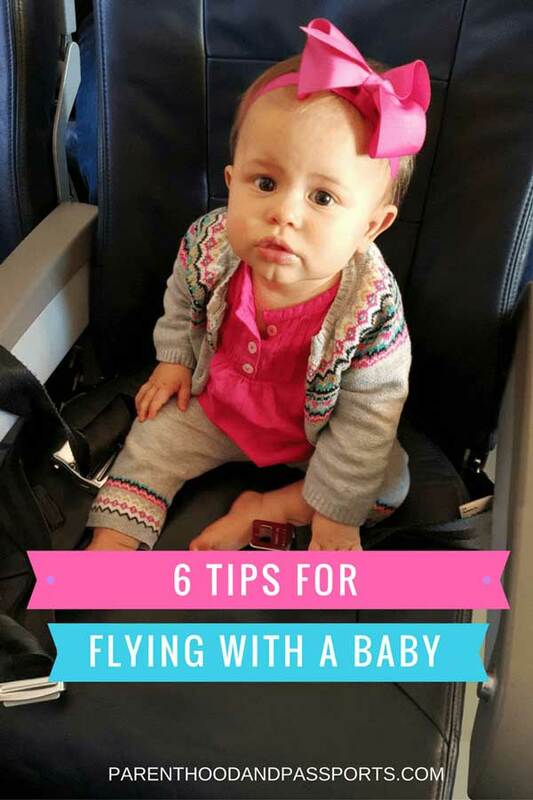 Although there is a lot to know about flying with a newborn, a baby, or a toddler, here are a few tips I’ve found to be most beneficial when flying with a baby. If you have a baby or toddler, the best way to travel, throughout an airport is to wear them in a baby carrier. I personally use the ErgoBaby Carrier and love it! Wearing them close to your body is calming for them and keeps you hands-free to pull a rolling suitcase, or juggle passports, boarding passes or other children. One of the best parts about wearing your baby through the airport is that you typically do not have to take them off to go through security. Although, TSA will do some additional testing after you go through the metal detector. It’s also much easier than lugging a stroller around for your entire vacation. The sucking motion associated with nursing or bottle feeding is not only soothing for babies, but it helps regulate the pressure in their ears. Adults can open their jaw to relieve the pressure that can build up as a plane makes an elevation change, but a baby cannot. If you nurse or give them a bottle or sippy cup during the ascent and decent, your baby won’t even notice the pressure change. Happy baby, happy mommy, happy plane-full of passengers. 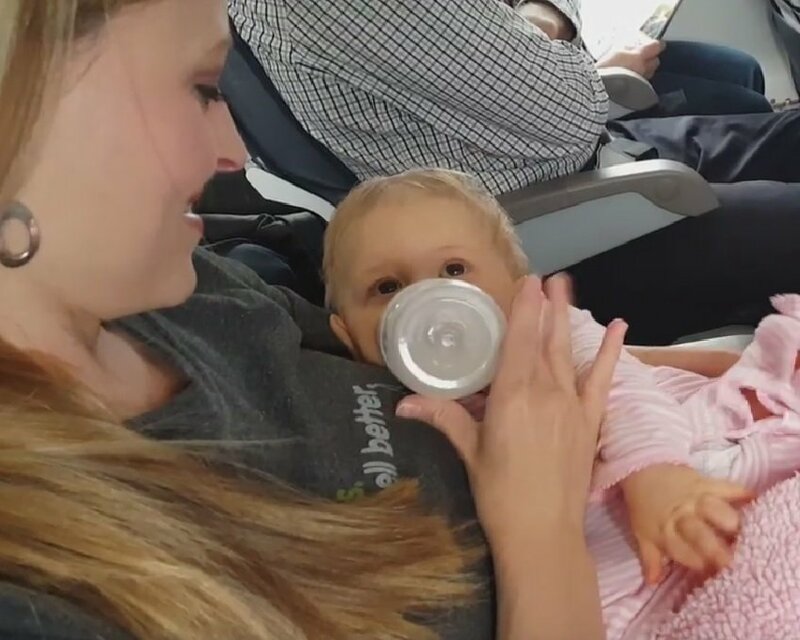 Not comfortable breastfeeding on a plane? Check out our tips for bringing expressed breastmilk or formula when you travel. This has saved me on at least a couple of flights when my baby was on the edge of a boredom meltdown. Prior to each flight, I buy a new toy. It doesn’t have to be expensive, but it must be new to them. I do not show her the toy or let her play with it until we are on the plane. That way she always has a new, exciting object to occupy her time for the duration of the flight. That means we can breath a sigh of relief (along with all the passengers sitting directly adjacent to us.) We still do this now that our daughter is older. It works when traveling with a toddler, as well. Hungry? I’ve got snacks. Bored? I’ve got toys, games and downloaded children’s shows on a fully charged iPad. A diaper blowout clear up to the neck? No problem, I have, not one, but two complete changes or clothes. Plus disinfectant wipes and a wet bag to store the dirty clothes. Can’t function without their beloved lovey or stuffed animal? Mom to the rescue. Let me just reach into my carry-on. My carry-on bag is essentially an arsenal kit for attacking any baby crisis. Whether we’re traveling as a family or I’m flying solo with our infant, the moment I sense a crisis on the verge of occurring, I break out the kit. This carry-on crisis kit is absolutely essential for air travel or road trips with a baby. Every. Parent. Must. Have. One. Your fellow passengers will thank you. If your child takes an afternoon nap, and you’re planning a short domestic trip, I’d recommend searching for flights around that time frame. If you are in luck, your child will fall asleep once you are wheels up, and you can enjoy a mid-flight cocktail. Or get a few minutes of shut eye yourself. Take it when you can get it. Having a baby is no joke, and parents live in a constant state of sleep deprivation! 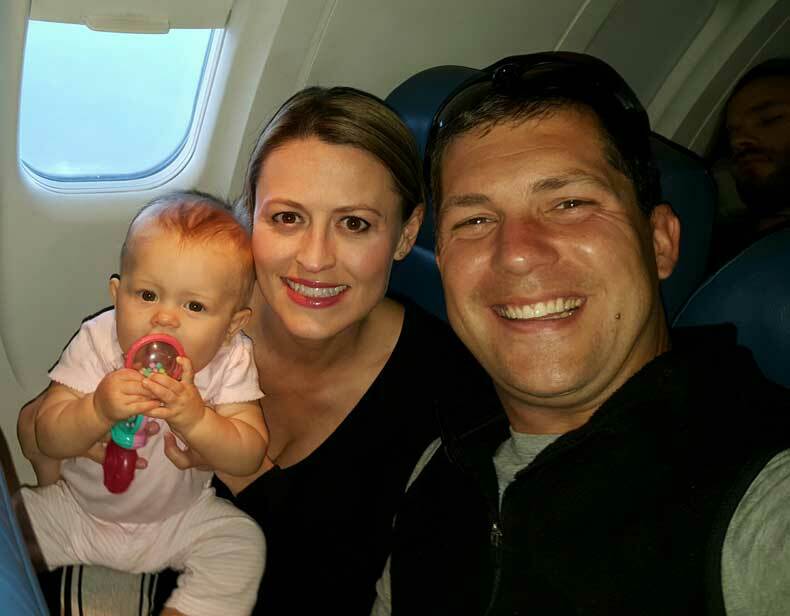 Have a comment or question about flying with a baby? We’d love to hear from you. Leave your thoughts in the comments below.